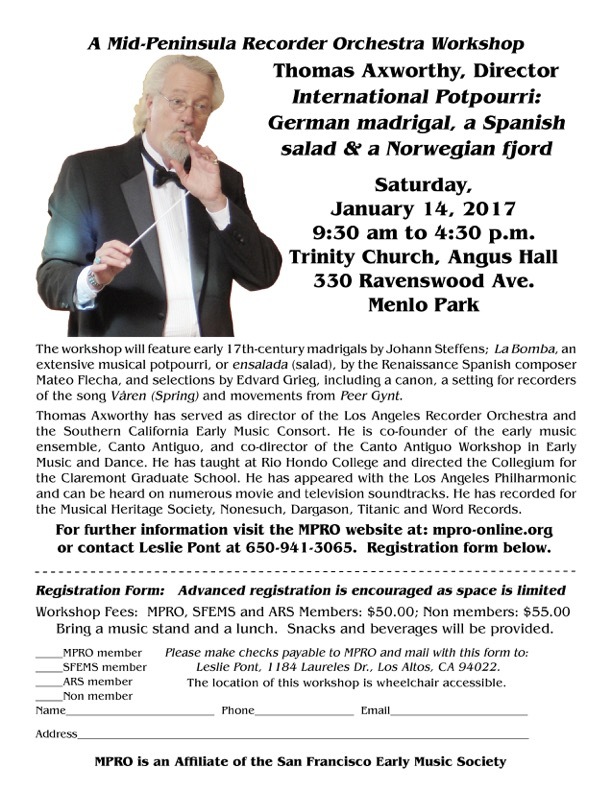 The somewhat unusual title of this article also describes a workshop I will be presenting in the San Francisco Bay Area this coming January, and the music featured will truly be an “international potpourri” inspired by a 16th-century Spanish musical genre known as the ensalada. Although ensalada means “salad” in Spanish it also refers to a renaissance musical composition that is similar to the quodlibet. A quodlibet combines several melodies into a form that pleases the listener (quod, "what" and libet, "pleases"). In the ensalada, literary texts and languages are combined and mixed to create an extended musical work designed for entertainment and amusement, and this serves to set the theme for the January workshop as we explore the music of various countries and periods allowing us to construct and experience our own ensalada. The workshop will begin with a selection of five-part madrigals by the late 16th-century German organist, Johanna Steffens. These vocal pieces show the influence of Steffens’ contemporary, Hans Leo Hassler, and contain melodies that are quite lovely. The texts are also interesting, one telling of monastic life that drifts into the love of wonderful wine and walks in the garden with young ladies. Next will be “La Bomba,” one of six works by Mateo Flecha found in Las Ensaladas de Flecha published in 1581 by his nephew of the same name. It is from this publication that we get the term, ensalada. “La Bomba” (“The Fire Pump”) is a Spanish “salad” that gives us a little bit of everything, including the lively story of a ship in distress as it is saved by the vessel’s pump, constant help from the Virgin Mary as honor is given to the birth of Christ, appropriately set in Latin, and all contained in a complex group of beautiful renaissance chansons with vibrant syncopated rhythms. We will continue on to 19th-century Norway with two selections from the Peer Gynt Suite No. 1 by Edvard Grieg, “Ase’s Death” and “In the Hall of the Mountain King,” with its incessant rhythms that drive to an exciting climax. Also featured will be the beautiful and hypnotic “Våren,” commonly know in English as “The Last Spring,” one of a pair of vocal works that Grieg arranged for instruments and titled, Two Elegiac Melodies. Included with these works will be a canon that Grieg composed in his younger years. The workshop will conclude with a musical curiosity by Victor Eijkhout, an entire symphony beginning with a rapid allegro, then a lovely minuet, a beautiful but short adagio and a snappy scherzo, all in fifteen seconds! This requires a tour de force of concentration on the part of the performers as they wind their way through the complex structure of the music in such a short period of time and will serve as an appropriate close to the day. On Saturday, January 14, Thomas Axworthy will be presenting a workshop for the Mid-Peninsula Recorder Orchestra featuring the music described in this article. See the next two pages for a copy of the workshop flyer, including a registration form. The flyer can also be printed from the orchestra’s web page at www.mpro-online.org. The web page has important additional information on parking, and a link to an interactive map with a Google Earth option to view parking locations. MPRO’s spring concert has been tentatively set for Saturday, May 6 in San Carlos. This date and location will be confirmed in early January. On Saturday, January 14, Thomas Axworthy will be directing a workshop for MPRO. You will find details about the workshop in this issue of Upbeat. Thomas Axworthy has served as director of the Los Angeles Recorder Orchestra as well as several other early music ensembles in Southern California and has extensive experience as a performer, teacher and workshop leader. I encourage everyone to take advantage of this opportunity to work under his direction and learn from his extensive musical background and performing experience. I am also pleased to announce that Greta Haug-Hryciw will continue as the orchestra’s Assistant Director and that Irene Beardsley will be playing keyboard with the orchestra at its upcoming spring concert. Music for the second half of the orchestra’s 2016-2017 season will include an antiphonal motet by the early 17th-century German master, Melchior Franck, and all three movements of the Vivaldi Concerto RV 531 with Gregor Dairaghi and Hilary Port bassoon soloists. We will also be playing the following music from the first half of the current season: three settings of Fortuna desperata, La Mer by Trenet and Lasry and La Canarie by Praetorius. Listed below is the music for the orchestra's first three meetings of the New Year. Please note that there will be sectional seating for the Franck Gloria Patri, qui creavit nos with those in Primus Chorus on the right as they face the conductor and those in Secundus Chorus on the left. Please observe this seating arrangement when you choose your place at the beginning of all three meetings. Please note as well that great bass and contrabass recorders as well as bassoons will be needed at all three meetings and sopranino recorder and krummhorns will be needed at the meetings on January 11 and February 8. Here are the program notes for the December 11 MPRO concert. We hope they will give you a more complete picture of the music you will be playing. At the end of the 16th century there was a major shift in Western music that was centered in Italy and began the transition from the Renaissance to the Baroque. This included a new Italian instrumental form called the canzona, in which contrasting sections of musical material created a varied and often highly dramatic texture. During the 17th century these sections became more and more independent, eventually becoming separate movements, which in turn led to the creation of the sonata and symphony that exist to this day. Giovanni Gabrieli’s La Spiritata is an outstanding example of the powerful force the canzona had on music and why it became such a decisive influence on the musical forms that succeeded it. The 15th-century Italian song Fortuna desperata inspired a rich collection of derivative pieces for almost seventy-five years after its composition. There are thirty-six known ensemble settings, the first of which is generally ascribed to Antoine Busnois - although others credit Antoine Brumel - as well as cantus firmus masses by Josquin and Obrecht. These re-workings include si placet versions (a line added later to be played “if you please”), replacement contratenor settings, secular cantus firmus compositions, liturgical and quasi-liturgical works, and pieces with Italian, French, German and Latin text. Among the well-known settings of this tune are the original three-voice version by Busnois and a richly set six-voice version by Alexander Agricola. The original melody is easily heard in the top voice of each of the three settings on our program. The first is anonymous, played on low recorders. The second, played on high instruments, is the original by Busnois, but with a si placet line in the second voice by an anonymous composer. The third is Agricola’s six-part setting, with both high and low recorders, giving it a full, orchestral quality. In this arrangement of La Mer, the recorder orchestra sets the mood by playing the underlying harmonies, giving the sense of gentle waves along the shore, modulating the chord structure for intensity and then returning, before the harmonica enters with its famous melody. This 1946 hit, with lyrics by Charles Trenet and music by Albert Lasry, has remained a chanson classic and jazz standard ever since. It was made popular in the United States when Bobby Darin recorded it as Beyond the Sea in 1960. The English lyrics, which do not correspond to the French, were written by Jack Lawrence. It has since been recorded by over four hundred artists in several languages, and used in the scoring of over twenty films. Trenet wrote the words to La Mer in 1943 while on the train returning from Narbonne to Paris along the French Mediterranean coast and was inspired by the view. It is said that he scribbled the song in ten minutes on toilet paper supplied by SNCF (the French national railway). Despite the fact that he was criticized by his contemporaries for preferring quantity over quality and his “weak counterpoint,” Antonio Vivaldi was one of the most influential composers of the early 18th century, thanks to the success of his twelve concertos Op. 3, published in 1711, which he entitled, L’estro armonico (Harmonic Innovation). These were some of the first examples of the new Italian concerto to be disseminated throughout Europe, and they had a major influence on composers outside of Italy, including the young J.S. Bach, who transcribed several for keyboard and incorporated their form and idiom in the style of many of his instrumental compositions. Following the publication of his concertos Op. 3, Vivaldi strove to develop a new style that was purely idiomatic to instruments, particularly strings. This can be heard in the numerous instrumental compositions he produced during his tenure at the Ospedale della Pietà, where he was responsible for providing the music played at regular public performances by the students housed at that orphanage. The concerto RV 531 belongs to this genre of Vivaldi’s works. Originally scored for two solo cellos and strings, it is presented this afternoon in a setting for two solo bassoons and recorder orchestra. The virtuosic writing for the soloists is a testimony to the technical skill of the performers that Vivaldi originally had in mind, and the Mid-Peninsula Recorder Orchestra is fortunate to have two bassoonists who are up to the challenge. Around 1610 the French violinist, Pierre Caroubel, gave the German composer, Michael Praetorius, a set of dance melodies that were popular at the court of Henri IV. Praetorius harmonized these melodies and published them in 1612 under the title Terpsichore. Among the over two hundred numbers found in this collection, there is the energetic La Canarie heard this afternoon with its emphatic downbeats that allow for the foot stomps called for in the choreography, which was meant to depict the dances of the natives of the Canary Islands. Georg Philipp Telemann’s unprecedented output of music has earned him a place in Guinness World Records as the most prolific composer in history, but he was also a poet, issued the world’s first music periodical, was the first to publish the music of Johann Sebastian Bach, advocated for the protection of intellectual property and increased female participation in musical performances and played a pivotal role in the development of opera buffa as well as the transition from the baroque to the classical style of Haydn and Mozart, all the while raising nine children, simultaneously serving as cantor to five churches in Hamburg and pursuing a career as a secular composer, which included organizing performances. What is even more remarkable is the exceptionally high quality of the music he produced and the scope of his musical imagination that is reflected in the wide range of instrumental combinations for which he wrote. The suite, La Joie, was originally scored for oboes, horns and bassoon and quite likely intended for outdoor performance. Since the music is for a wind ensemble, it is very effective when transcribed for recorders, and even the tone color of the horns can be heard in the recorder arrangement. MPRO members and significant others are invited to a holiday party at Mary Ashley's home, on Wednesday, December 14 at 6:30 p.m. Mary's address is 3114 Cowper Street in Palo Alto. Her phone number is (650) 494-1829. Please bring a dish to share. Drinks and coffee will be provided. 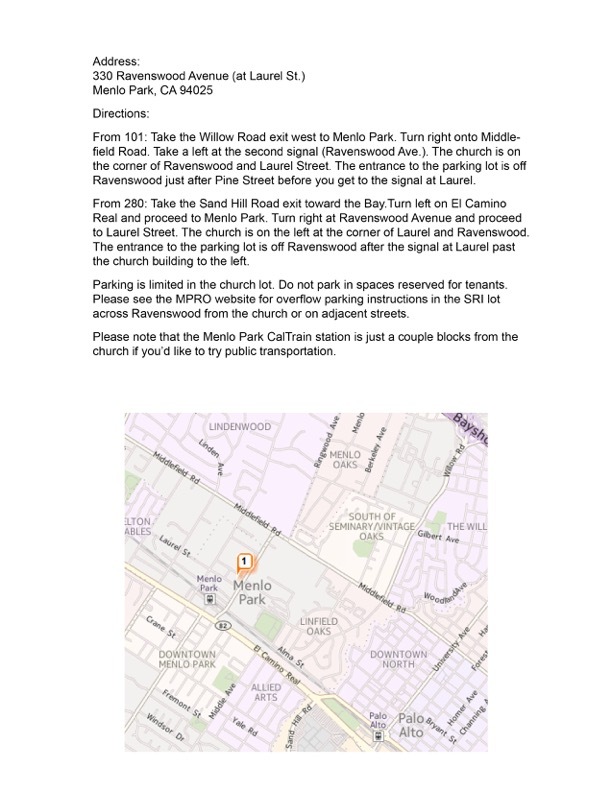 An invitation with a map, directions to Mary's house, and parking will be sent to MPRO members who have email. Paper copies will be available at rehearsals. This link to the Franck piece has the words in Latin and English and a MIDI recording at a faster tempo than the YouTube recording above.